Anti-neutrophil cytoplasmic antibody (ANCA)-associated vasculitis is the most common cause of rapidly progressive glomerulonephritis worldwide, and the renal biopsy is the gold standard for establishing the diagnosis. Although the prognostic value of the renal biopsy in ANCA-associated glomerulonephritis is widely recognized, there is no consensus regarding its pathologic classification. We present here such a pathologic classification developed by an international working group of renal pathologists. Our classification proposes four general categories of lesions: Focal, crescentic, mixed, and sclerotic. To determine whether these lesions have predictive value for renal outcome, we performed a validation study on 100 biopsies from patients with clinically and histologically confirmed ANCA-associated glomerulonephritis. Two independent pathologists, blinded to patient data, scored all biopsies according to a standardized protocol. Results show that the proposed classification system is of prognostic value for 1- and 5-year renal outcomes. We believe this pathologic classification will aid in the prognostication of patients at the time of diagnosis and facilitate uniform reporting between centers. This classification at some point might also provide means to guide therapy. Anti-neutrophil cytoplasmic antibody (ANCA)-associated vasculitis, particularly Wegener's granulomatosis and microscopic polyangiitis, often affect the kidneys,1 and renal involvement is an important factor with respect to patient morbidity and mortality.2 Although rapidly progressive renal failure in patients who are seropositive for ANCA by indirect immunofluorescence or ELISA is suggestive of ANCA-associated glomerulonephritis, the morphologic changes in the renal biopsy are still the gold standard for establishing a diagnosis. ANCA-associated glomerulonephritis is characterized on immunofluorescence microscopy by little or no glomerular staining for Igs or complement, the so-called pauci-immune staining pattern. By electron microscopy, subendothelial edema, microthrombosis, and degranulation of neutrophils are present,3 but immune deposits are absent. Light microscopy shows necrotizing and crescentic glomerulonephritis.4 Until now, there has been no histopathologic classification of ANCA-associated glomerulonephritis, although there is a clinical need to distinguish the levels of severity. Although a standardized scoring protocol for renal biopsies of patients with ANCA-associated vasculitis, with good reproducibility, was developed previously,16 a histopathologic classification is still lacking. Considering the substantial diagnostic and prognostic value of the renal biopsy in ANCA-associated glomerulonephritis, we propose a histopathologic classification that is based on glomerular pathology. Most histologic classifications of renal diseases17–19 have been primarily based on expert experience; our proposed classification, however, is also validated with patient data. 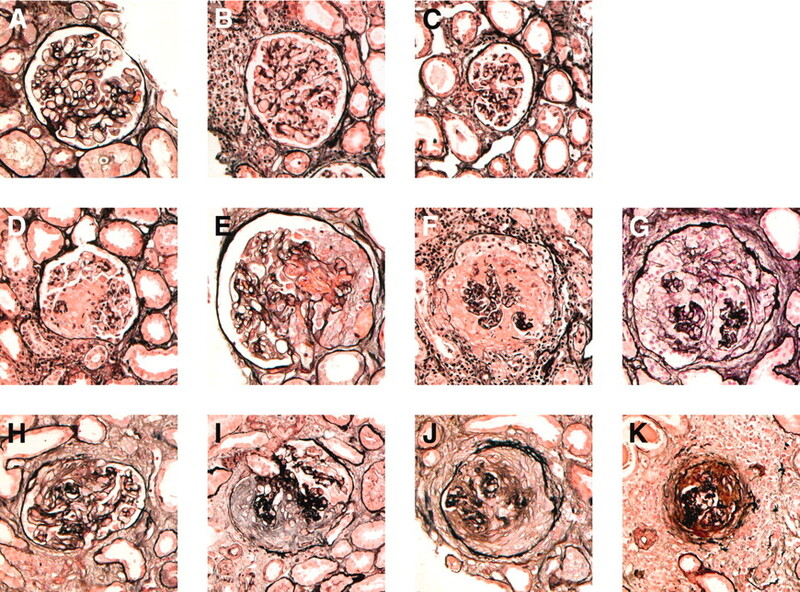 The proposed classification is based on glomerular pathology as assessed by light microscopy. For classification purposes, adequacy of tissue specimens and histopathologic techniques is essential. A minimum of 10 whole glomeruli are considered adequate.18 Hematoxylin and eosin, methenamine silver, and periodic acid-Schiff stainings are minimally required for examining renal histopathology. A Masson trichrome staining or one of its variants can be helpful to visualize fibrinoid necrosis, acute tubular necrosis, and interstitial fibrosis but is not necessary for our proposed classification schema. The classification is built around four general categories: Focal, crescentic, sclerotic, and mixed. The categories labeled focal, crescentic, and sclerotic are based on the predominance of normal glomeruli, cellular crescents, and globally sclerotic glomeruli, respectively. The mixed category represents a heterogeneous glomerular phenotype wherein no glomerular feature predominates. Definitions of histologic variables used in our classification are reported in Table 1, and the classification schema is depicted in Table 2. The biopsies in the focal category contain ≥50% normal glomeruli that are not affected by the disease process. The crescentic category contains biopsies with ≥50% of glomeruli with cellular crescents. Biopsies from the sclerotic category contain ≥50% of glomeruli with global sclerosis. All remaining biopsies (Figure 1) are, per definition, not characterized by one predominant glomerular phenotype and form the mixed category. These latter biopsies will have all aforementioned glomerular features to varying degrees. Classification flowchart. Biopsies should be scored for glomerular lesions in the following order: Globally sclerotic glomeruli, normal glomeruli, and cellular crescentic glomeruli. Any biopsies that do not fit into one of the categories on the basis of a predominant glomerular phenotype will automatically be included in the mixed category. The proposed classification system hinges on the recognition of normal glomeruli, glomeruli with cellular crescent formation, and glomeruli with global glomerulosclerosis. Straightforward as this may seem, interobserver disagreement may arise for recognition of these features in individual glomeruli. We refer to Figure 2 for typical examples of glomeruli that belong or do not belong to the various categories of classification. Furthermore, we now offer explicit guidelines to distinguish these features in more detail. Typical examples of glomerular lesions in each of the four categories. (A through C) Normal glomeruli, allowing for fewer than four leukocytes in the capillary tuft (B) or mild ischemic changes such as wrinkling of the GBM (C). Cellular crescents contain >10% of cellular components. Whether crescents are segmental or circumferential is irrelevant for the classification schema. (D through G) Examples of cellular crescents. The amount of fibrinoid necrosis is irrelevant. (H through J) If >90% of a crescent consists of extracellular matrix, then the term fibrous crescent is used. (K) Global glomerulosclerosis refers to sclerotic changes in the glomerulus composing >80% of the tuft. Global glomerulosclerosis excludes the designation of any other glomerular lesion. According to the definition provided in Table 1, a normal glomerulus does not exhibit features of vasculitic lesions or global glomerulosclerosis. It also should not show intracapillary proliferation, meaning no extensive endothelial swelling or proliferation in more than one capillary loop or more than four intracapillary inflammatory cells (neutrophils, lymphocytes, or monocytes) in all of the glomerular capillary bed. Normal glomeruli should not have synechiae or any local or segmental glomerulosclerosis. Normal glomeruli may show subtle signs of ischemia: Slight collapse of the tuft, focal splitting of Bowman's capsule, or focal wrinkling of the GBM. Ischemia may lead to a more prominent appearance of the parietal epithelium of Bowman's capsule. As long as the epithelium remains as a monolayer and does not show signs of atypia or influx of inflammatory cells, these changes could be accepted within the scope of ischemia and not be regarded as extracapillary proliferation. We refer to Figure 2 showing examples of subtle versus overt changes as a result of ischemia, giving guidance as to which are still acceptable in the context of a normal glomerulus. Cellular crescents are defined as either purely or partially cellular crescents in which fibrous components are allowed. They are distinct from fibrous crescents, which are defined as purely fibrotic lesions in which a cellular component is virtually absent. If >90% of a crescent consists of extracellular matrix, then the term fibrous crescent is used. As long as the crescent contains cellular components >10%, it is regarded as a cellular crescent, irrespective of whether it is segmental or circumferential or whether it contains other components such as fibrin or is accompanied by a periglomerular granulomatous reaction or by breaks in Bowman's capsule. Whether the glomerulus has a fibrinoid necrotic lesion is not regarded as relevant for classification purposes. Segmental crescents show extracapillary proliferation in <50% of the circumference of Bowman's space, whereas circumferential crescents show extracapillary proliferation in >50% of Bowman's space. We define global glomerulosclerosis as sclerotic changes in the glomerulus that compose >80% of the tuft. It is irrelevant whether the global glomerulosclerosis is attributable to ANCA-associated glomerulonephritis. In our classification system, global glomerulosclerosis excludes the designation of any other glomerular lesion. The current proposal for ANCA-associated glomerulonephritis is based purely on the presence of glomerular lesions; however, tubulointerstitial lesions may also be of prognostic value in ANCA-associated vasculitis.7,15 For guidelines on how to report systematically on tubulointerstitial and vascular lesions, we refer to the scoring form that was devised previously for the standardized evaluation of biopsies with ANCA-associated glomerulonephritis.16 Unless the findings are remarkable, tubulointerstitial and vascular lesions need not be mentioned in the final diagnosis. Examples of remarkable findings are a dominance of any cell type in the infiltrate (plasma cells or eosinophils), a high number of interstitial granulomas, or extensive arteriosclerosis. Some of these findings may have clinical consequences or be of importance in the differential diagnosis of other diseases, such as drug hypersensitivity, infection, or cardiovascular disease. Following the stringent inclusion criteria described in the Concise Methods section, a total of 100 patients with at least 1 year of follow-up and adequate renal histology were included in a validation study. These patients came from 32 centers in nine European countries. Median age at baseline was 62.6 years (range 20.4 to 80.7 years). The male-to-female ratio was 54:46. All 100 patients had a clinicopathologic diagnosis of Wegener's granulomatosis (n = 39) or microscopic polyangiitis (n = 61) with pauci-immune crescentic glomerulonephritis. ANCA test results by indirect immunofluorescence or ELISA were available for 97% of patients (PR3-ANCA n = 45, MPO-ANCA n = 47, negative ANCA test n = 2, missing n = 3). Thirty-five patients reached ESRD, and mean time to reach ESRD was just over 1 year from baseline. The median number of glomeruli per biopsy was 14.8 (range 10.0 to 49.0). Following the proposed classification and flow chart (Table 2, Figure 1), 13 biopsies were classified as sclerotic ANCA-associated glomerulonephritis (≥50% globally sclerotic glomeruli). Of the 87 biopsies left, 16 were classified as focal (≥50% normal glomeruli). After taking out the biopsies that were classified as sclerotic or focal, 71 were left for study. Fifty-five of these biopsies demonstrated ≥50% of glomeruli with cellular crescents, and these biopsies were classified as crescentic. No biopsy showed >50% pure fibrous crescents. The remaining 16 biopsies could not be classified into a predominantly sclerotic, focal, or crescentic phenotype and were classified as a mixed phenotype. None of the biopsies in this cohort exhibited 50% globally sclerotic glomeruli together with 50% normal glomeruli or glomeruli with cellular crescents. Likewise, no biopsies exhibited 50% normal glomeruli and 50% crescentic glomeruli. The 16 biopsies that were classified as demonstrating a mixed phenotype had on average approximately 27% globally sclerotic glomeruli, approximately 21% normal glomeruli, and approximately 32% glomeruli with cellular crescents. Approximately 15% of glomeruli in these biopsies exhibited purely fibrous crescents, and the remaining 5% of glomeruli exhibited either local/segmental glomerulosclerosis or ischemia. As depicted in Table 3 and Figure 3, the renal biopsy categories were correlated to the degree of renal function at presentation and at 1- and 5-year follow-up (all P ≤ 0.001), with the sequence of category (focal, crescentic, mixed, and sclerotic) corresponding to the order of severity of renal function loss. In multiple linear regression analyses investigating independent predictors for estimated GFR (eGFR) at 1 and 5 years and taking into account patient age, treatment limb, baseline eGFR, and the classification system, baseline eGFR and renal biopsy category were the only independent predictors for eGFR at both follow-up events, as depicted in Table 4. Adjusted R2 values for the models at 1 and 5 years are 0.61 and 0.49, respectively, indicating that these models account for considerable percentages of the variance in eGFR at these time points. The histologic categories are strongly and independently correlated with renal function at baseline and during follow-up, with the phenotypical order of categories (focal, crescentic, mixed, and sclerotic) corresponding to the order of severity of renal function impairment. (A) Baseline renal function (mean ± 95% confidence interval) is depicted according to histologic class. (B through D) Mean ± 95% confidence interval renal function values for the four classes at 1 year of follow-up are depicted uncorrected for baseline eGFR (B) and corrected for baseline eGFR (C); the same applies for renal function values at 5 years of follow-up (D and E). Regarding the hard end point of development of ESRD, as depicted in Figure 4, the absolute number of events was limited. Renal survival data were available for 82 of 100 patients. A total of 25 patients developed ESRD during the follow-up period. ESRD developed in one of 14 patients with focal, in 11 of 45 patients with crescentic, in six of 13 patients with mixed, and in seven of 10 patients with sclerotic ANCA-associated vasculitis. The data show that the percentage of patients who developed ESRD increases with ascending category (P = 0.003). 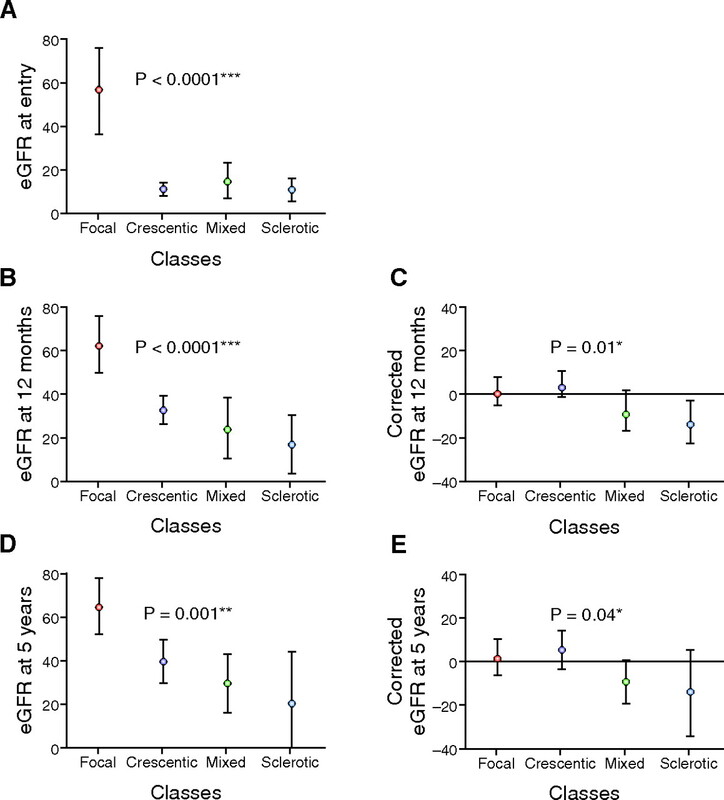 A multiple Cox regression analysis, including patient age, treatment, baseline eGFR, and the classification, demonstrates that patients who present with crescentic ANCA-associated glomerulonephritis are at decreased risk for developing ESRD compared with patients who present with sclerotic ANCA-associated glomerulonephritis (hazard ratio 0.176; 95% confidence interval 0.057 to 0.574; P = 0.003). Renal survival (no development of end-stage renal failure) is depicted according to the four histologic categories. Renal survival at 1 year was 93% for patients whose renal biopsies were classified as focal at the time of diagnosis, 84% for patients whose biopsies were classified as crescentic, 69% for patients whose biopsies were classified as mixed, and 50% for patients whose biopsies were classified as sclerotic. Renal survival percentages at 5 years were 93% (focal class), 76% (crescentic class), 61% (mixed category), and 50% (sclerotic category). In the sclerotic category, renal survival at 7 years was only 25%. Investigating renal outcome by looking at renal function during follow-up does not take into account patients who have died, and in survival analyses, these patients are censored. We have taken the Kidney Disease Outcomes Quality Initiative (KDOQI)28 classification of chronic kidney disease stages as an example to describe different categories of renal outcome at 1 year, primarily on the basis of renal function (ml/min per 1.73 m2). The following four classes are considered: eGFR ≥60, eGFR 15 to 59, eGFR <15 or on dialysis, and death within the first year. Results of this exercise are depicted in Table 5 and illustrate that patients with sclerotic ANCA-associated glomerulonephritis not only have decreased chances of renal survival but also are at a higher risk for death. To assess the contribution of tubulointerstitial parameters to the classification system, we investigated the influence on the classification of either a combined score of fibrosis and tubular atrophy or individual scores of fibrosis, tubular atrophy, and intraepithelial infiltrates. Although, in general, a slight dichotomy could be seen within the four glomerular classes, wherein patients with more extensive tubulointerstitial damage had worse renal outcome, the data were not convincing enough to adjust the classification system accordingly for any of the tubulointerstitial parameters. Particularly, adjusted R2 values obtained for the models taking into account the glomerular classification system as well as tubulointerstitial parameters and renal function at 1 and 5 years, did not differ from the adjusted R2 values for the model taking into account glomerular pathology only (data not shown), indicating that the model including tubulointerstitial parameters did not account for a greater percentage of variance in eGFR at follow-up; therefore, including tubulointerstitial parameters in the classification system is unnecessary and only increases its complexity. ANCA-associated vasculitis is the most frequent cause of rapidly progressive glomerulonephritis worldwide, and the renal biopsy is the gold standard for establishing the diagnosis of ANCA-associated glomerulonephritis.29,30 The diagnostic and prognostic value of the renal biopsy in ANCA-associated vasculitis is widely known. We present here a proposal for a pathologic classification for ANCA-associated glomerulonephritis. The proposed classification schema has been developed by an international working group of renal pathologists, and we report its validation on a set of 100 renal biopsies that were scored in a standardized manner. The classification system is composed of four categories. The focal category contains biopsies wherein ≥50% of glomeruli are not yet affected by the disease. In the crescentic category, more than half of the glomeruli have cellular crescents. The mixed category involves biopsies in which a combination of normal, crescentic, and sclerotic glomeruli are present, all occurring in <50% of glomeruli. Forming the sclerotic category are biopsies characterized by ≥50% globally sclerotic glomeruli. Our validation study shows that the phenotypical order of the classes corresponds to the order of severity of renal function impairment during follow-up. Patients with focal ANCA-associated glomerulonephritis present with relatively preserved renal function and have a relatively favorable renal outcome. Patients with crescentic ANCA-associated glomerulonephritis present with highly active renal disease and severely reduced renal function but stand a good chance for renal function recovery. Patients with a mixed phenotype have an intermediate outcome profile. 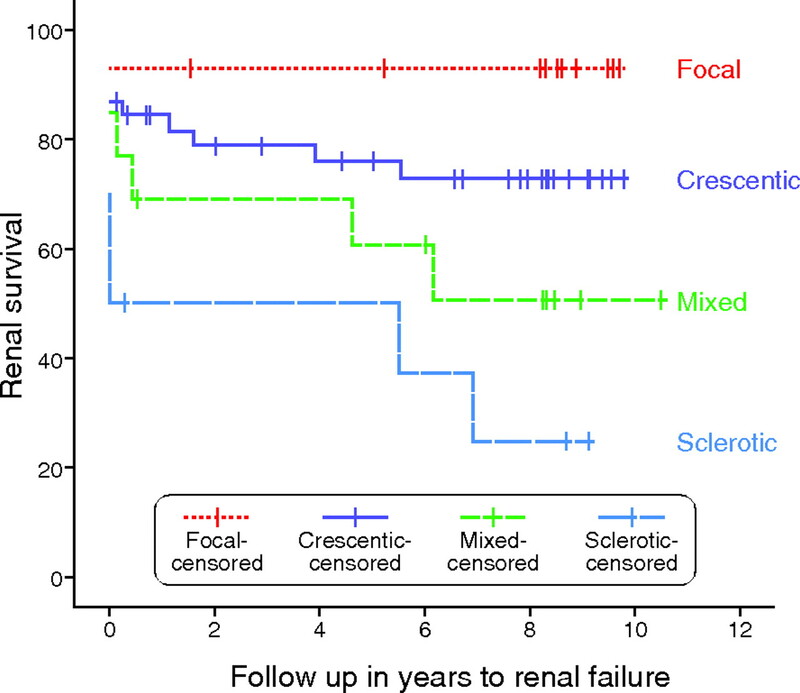 Patients with sclerotic ANCA-associated glomerulonephritis at the time of biopsy, run the highest risk for not recovering renal function and also have a higher risk for death within the first year after diagnosis. This classification proved practical during an initial validation exercise. None of the 100 biopsies exhibited 50% globally sclerotic glomeruli together with 50% normal glomeruli or glomeruli with cellular crescents. Likewise, no biopsies that exhibited 50% normal glomeruli and 50% crescentic glomeruli were encountered. This indicates, in this cohort, that each biopsy clearly has one predominant glomerular feature or demonstrates a mixed phenotype. No biopsy had an overlap between categories. Additional validation cohorts will be required to confirm these conclusions. In cases in which exactly 50% of glomeruli are consistent with one feature and 50% with another feature, the flow chart (Figure 1) will be helpful in making the final decision. The limitations of this study reflect problems encountered when studying relatively rare diseases. Material for the validation study came from various centers where it was processed in comparable but not exactly identical ways. Although this was an international study, all patients were seen in European centers only. The interobserver variation for the histopathologic parameters on which the classification was based was previously established, and consensus was reached for each parameter during various meetings16; however, the division into the four categories now devised is based on the initial scores of individual parameters. No interobserver variation study was undertaken purely for classifying biopsies according to our proposal. We encourage further validation of this classification for ANCA-associated glomerulonephritis in different cohorts throughout the world, and hopefully this will lead to classification refinements. This classification will be of aid in the prognostication of patients at the time of diagnosis and will facilitate uniform reporting between centers. Renal histology data from patients who were entered into two randomized controlled trials (CYClophosphamide or AZathioprine As a REMission therapy for vasculitis [CYCAZAREM] and Methylprednisolone versus Plasma Exchange as additional therapy for severe, ANCA-associated glomerulonephritis [MEPEX]31,32) conducted by the European Vasculitis Study Group between March 1995 and September 2002 were pooled. Trial outcomes and clinicopathologic studies from these trials were previously published.7,8,31,32 For this study, patients who had been followed-up for at least 12 months (including patients who died within the first 12 months but excluding patients who were lost to follow-up) were included. Five-year follow-up was available for a subset of patients and reported on. Adequacy of tissue specimens and histopathologic techniques are mandatory for a reliable classification. For this validation exercise, we included biopsies with a minimum of 10 whole glomeruli.18 Hematoxylin and eosin, methenamine silver, periodic acid-Schiff, and Masson trichrome stainings were available for evaluation. All biopsies were scored independently by two pathologists, who were blinded to patient data, from a group of five pathologists (F.F., I.M.B., J.A.B., L.H.N., and R.W. ), according to a previously standardized protocol; discrepancies were resolved during consensus meetings.16 Patients with Churg-Strauss syndrome were not included in this study, and this classification proposal is not validated for these patients. GFRs were estimated using the four-variable Modification of Diet in Renal Disease (MDRD) equation.33,34 To evaluate an independent predictive effect of the classification on eGFR at 1 and 5 years of follow-up, we corrected for the eGFR at baseline. The corrected eGFR at a time point was defined as the difference between the observed eGFR at that time point and its linear prediction on the basis of baseline eGFR.33,35 In addition to renal function at different follow-up times, renal survival, defined as time to end stage renal failure, was assessed. χ2, one-way ANOVA, and multiple linear regression analyses were performed as appropriate. Renal survival was assessed using the Kaplan-Meier method. Differences between categories were assessed using the log-rank test. Hazard ratios were acquired using Cox proportional hazards regression. P < 0.05 was considered significant. The CYCAZAREM trial was supported by contracts (BMH1-CT93-1078, CIPD-CT94-0307, BMH4-CT97-2328, and IC20-CT97-0019) with the European Union; the MEPEX trial was designed and launched as part of the European Community Systemic Vasculitis Trial project (BMH1-CT93-1078 and CIPD-CT94-0307) and finished as part of the ANCA Associated Vasculitis European Randomized Trial project (BMH4-CT97-2328 and IC20-CT97-0019) funded by the European Union. Participating physicians include D. Abramowicz, J. Sennesael, Free University of Brussels, Brussels, Belgium; M. Wissing, P. Madhoun, Edith Cavell Medical Institute, Brussels, Belgium; M. Dhaene, Clinique Louis Caty, Baudour, Belgium; D. Blockmans, University Hospital, Leuven, Belgium; J. Stolear, IMC de Tournai, Tournai, Belgium; V. Chabova, I. Rychlik, V. Tesar, Charles University Hospital, Prague, Czech Republic; N. Rasmussen, Rigshospitalet, Copenhagen, Denmark; A. Wiik, Statens Seriminstitutet, Copenhagen, Denmark; C. Grönhagen-Riska, A. Ekstrand, University of Helsinki, Helsinki, Finland; P. Lesavre, Hôpital Necker, Paris, France; L. Guillevin, Hôpital Cochin, Paris, France; P. Vanhille, Centre Hospitalier, Valenciennes, France; K. Andrassy, O. Hergesell, Heidelberg University Hospital, Heidelberg, Germany; F. van der Woude, R. Nowack, University of Mannheim, Mannheim, Germany; K. de Groot, University Hospital, Hannover, Germany; H. Rupprecht, P. Weber, S. Weidner, Klinikum Nürnberg, Nürnberg, Germany; W. Schmitt, W. Gross, University of Luebeck and Rheumaklinik Bad Bramstedt, Luebeck, Germany; M. Schneider, C. Specker, Heinrich Heine Universität, Düsseldorf, Germany; M. Vischedyk, St. Vinzenz-Hospital Paderborn, Paderborn, Germany; C. Feighery, St. James Hospital, Dublin, Ireland; G. Gregorini, Spedali Civili, Brescia, Italy; R. Sinico, F. Ferrario, Ospedale San Carlo Borromeo, Milan, Italy; R. Confalonieri, Ospedale Niguarda, Niguarda, Italy; J. Dadoniené, University of Vilnius, Vilnius, Lithuania; C. Kallenberg, C. Stegeman, University Hospital, Groningen, Netherlands; E. van Gurp, E. Hagen, Meander Medical Center, Amersfoort, Netherlands; C. Siegert, C. Verburgh, R. de Lind van Wijngaarden, Leiden University Medical Center, Leiden, Netherlands; J.W. Cohen Tervaert, Maastricht University Medical Center, Maastricht, Netherlands; A. Serra, Hospital Germans Trias i Pujol, Badalona, Spain; E. Mirapeix, Hospital Clinic i Provincial, Barcelona, Spain; M. Valles, Hospital Doctor Josep Trueta, Girona, Spain; R. Poveda, Hospital Bellvitje, Barcelona, Spain; J. Ballarin, Fundació Puigvert, Barcelona, Spain; J. Ballarin, F. Calero, Fundación Puigvert, Barcelona, Spain; A. Bruchfeld, E. Pettersson, M. Heimburger, Huddinge University Hospital, Stockholm, Sweden; G. Germanis, Danderyds Sjukhus, Danderyds, Sweden; D. Selga, K. Westman, University of Lund, Lund, Sweden; Z. Heigl, I. Lundberg, E. Svenungssen, Karolinska Sjukhuset, Stockholm, Sweden; M. Segelmark, G. Sterner, University Hospital of Malmö, Malmö, Sweden; M. Tidman, Nephrology University Hospital, Orebro, Sweden; P. Mathieson, C. Tomson, Southmead Hospital, Bristol, United Kingdom; R. Watts, Ipswich Hospital, Ipswich, United Kingdom; J. Feehally, University Hospital, Leicester, United Kingdom; A. Burns, Royal Free Hospital, London, United Kingdom; R. Luqmani, N. Turner, Royal Infirmary, Edinburgh, United Kingdom; D. Adu, L. Harper, C. Savage, P. Bacon, University of Birmingham, Birmingham, United Kingdom; G. Gaskin, Imperial College, London, United Kingdom; P. Mason, Churchill Hospital, Oxford, United Kingdom; D. Oliveira, St. George's Hospital, London, United Kingdom; J. Stevens, Southampton Hospital, Southampton, United Kingdom; A. Williams, Morriston Hospital, Swansea, United Kingdom. We thank Oliver Flossmann (Cambridge), Herbert Hauer (Leiden), and Rob de Lind van Wijngaarden (Leiden) for data management.